The government on Monday announced measures to prevent accidents at coal power plants in the country, six days after an accident at Taean power plant claimed the life of a subcontracted worker. Past accidents at power plants will also be reviewed. The Ministry of Employment and Labor and the Ministry of Trade, Industry and Energy held a joint briefing on Monday and apologized for the death of Kim Yong-kyun, a 24-year-old subcontracted worker at the Taean thermal power plant. On Tuesday, Kim was found dead after getting stuck between a conveyer belt and machinery. Kim is reported to have been alone on the night shift, carrying out work that should have been done in pairs. “We are deeply sorry for what happened to the late Kim Yong-kyun. Our deepest sympathies go out to the family of the deceased,” Labor Minister Lee Jae-gap said. 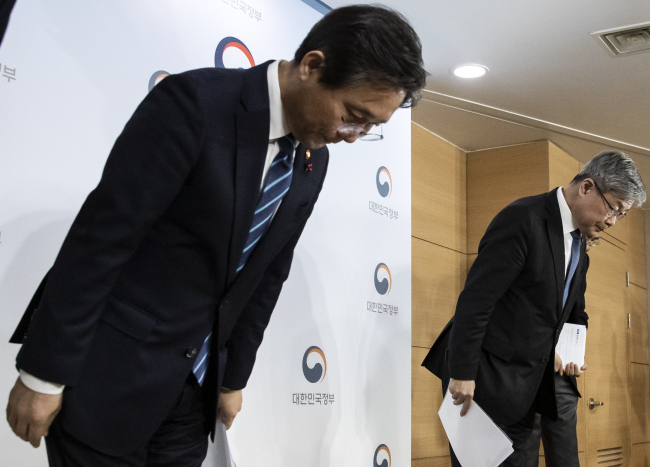 To prevent the reoccurrence of such accidents, the ministers promised to carry out a thorough investigation into Kim’s case and to conduct safety checks on other power plants. The Labor Ministry will launch a special labor supervisory team and examine if the Taean power plant had violated any laws. Stringent safety checks will also be conducted at the power plant, along with checks on 12 coal power plants in the country to examine whether the plants are strictly adhering to safety regulations. Moreover, the ministry will re-examine past accidents at coal power plants amid rising criticism of the harsh working conditions of irregular workers at such workplaces. According to the Taean power plant, a total of 58 workplace accidents have occurred in the past nine years, which led to the death of seven people. The death toll, however, has increased to 11, as local media outlets reported Sunday that the plant tried to omit two accidents that happened in 2011 and 2016. The Ministry of Trade, Industry and Energy said it would get the coal power plants to require working in pairs when workers perform safety checks under dangerous conditions. In addition, the ministry will push the plants to ban workers who have worked less than six months from conducting fieldwork alone. It will also require the workers to be fully equipped with safety gear. The ministry added it will examine whether the plants have sufficient manpower and require them to hire more workers if necessary.